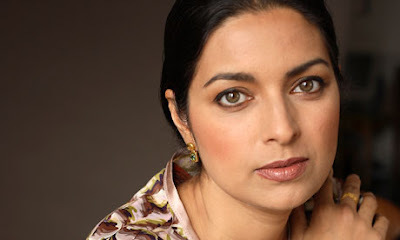 Today is the birthday of Jhumpa Lahiri (books by this author), born in London (1967). Her parents were Bengali immigrants from India. When Lahiri was two years old, her father got a job as a librarian at the University of Rhode Island, and they moved to America. On weekends, the whole family would get together with other Bengali families, sometimes driving for hours to other states for a party. The adults cooked Bengali food and spoke Bengali and reminisced; the kids all watched television together. And even though she's lived in America from toddlerhood, she struggles with not feeling American. "For me," she says, "there is sort of a half-way feeling." Throughout her childhood, Lahiri wrote stories to entertain herself. She went to college at Barnard, then to graduate school at Boston University. She was on the verge of going to work in retail when Houghton Mifflin agreed to publish her first book for a small advance. That book was The Interpreter of Maladies (1999), a collection of nine stories about Bengalis and Bengali-Americans living in suburban New England. The publishers didn't expect to sell many copies so they only released it in trade paperback. As expected, it didn't get much notice at first, but one day she got a phone call from a woman from Houghton Mifflin, asking a lot of questions about Lahiri's background. Lahiri assumed it was for promotional materials. "And then she said, 'You don't know why I am calling, do you?'" Lahiri recalled. "And I said, 'No, why are you calling?' And she said, 'You just won the Pulitzer.'" It was the first time a trade paperback had ever won the Pulitzer Prize. Over the last few years, Jhumpa Lahiri has become a favorite author and I credit her with my recently developed love of short stories. Unaccustomed Earth was on my 'Best of' list several years ago and it lead me to the audio version of Interpreter of Maladies. I also enjoyed her novel, The Namesake, and hope another novel or short story collection will be published soon. Terri - It's time for me to reread them, too! I love this author! I've read both Interpreter of Maladies and Unaccustomed Earth and they were absolutely GORGEOUS books. Plus she is beautiful. I still need to get my hands on The Namesake. I refuse to see the movie until I read it. Sandy - I think her short stories are much stronger, but The Namesake is definitely worth reading! I love Jhumpa Lahiri's writing. Now I work in a predominantly Bengali community I should re read the ones I've got. Happy Birthday Jhumpa! Joan Hunter Dunn - I love her writing, too! Hope there will be a new book out soon. I love that story about how she heard she'd won the Pulitzer! Softdrink - Isn't that the best? Talk about an unexpected honor!! Arti - Lahiri has such an amazing voice and Unaccustomed Earth is one of my favorites. It's good to know that her immigrant experience stories resonate with those who have actually lived through it. I've never watched The Namesake, but should add it to my list. Diane - Isn't she wonderful? So cool that she worked in your library... even if you weren't here yet. I hope we don;t have to wait too much longer for another one of her books! What a great post! I've seen the author's beautiful face before and knew about her short story collection. I didn't know about the rest. Thanks for informing the rest of us. Vasilly - Lahiri is such a beautiful and talented woman. I love the story about her winning the Pulitzer... can't wait for her next book! I need to read this author! Kathleen - Yes, you MUST read Lahiri. She is an amazing writer!